An impressive, 46-page Value Investor Club write-up on Tesla was published by user jcoviedo Monday and promptly leaked thereafter, which – not surprisingly – pitched a short thesis which sees the stock price 1st dropping to Elon Musk’s margin call level of roughly $200/share, after which a “massive reset” as core investors dump, sends it below $50 share. Tesla is in effect a modified Ponzi scheme. Throughout its history, the company has financed its operations by announcing a new product (originally the roadster, then the Model S, the Model X, the Model 3, the Semi, the roadster 2, and now the Model Y as well as the vaporware full self driving package) and then taking deposits for the product before it has ever designed a production system for the product. The company then spends the deposits on operating expenses and the capital expenses to manufacture the original product. When the company is close to running out of funds, the company announces a new product and takes deposits on it in order to finish the production of the first product. Since 2008, 78% of TSLA’s cash flow from operations has come from customer deposits! While it is debatable whether this practice is legal or not, there it one thing it clearly isn’t, especially in the long run: sustainable. And Mr. Musk knows it. As the report’s author points out, “unlike a bank, Tesla does not segregate customer deposits and in reality customer depositors are just unsecured creditors of the company. 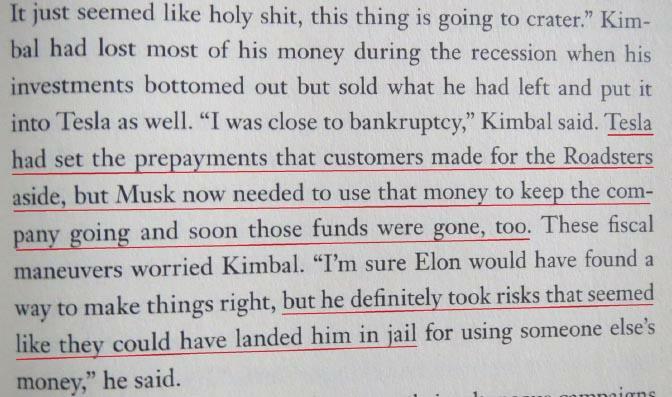 In Ashlee Vance’s Elon Musk biography he has a telling scene in late 2008, Kimbal Musk worries about the legal implications of Elon raiding the customer deposits in order to keep the lights on. Is this a harbinger of what is coming for Tesla customers 1st, and shareholders next? If that is indeed the case, then sustaining demand for the company’s products – in the form of millions of fronted deposits – means the difference between life and liquidity death for Tesla. “With a sharp demand slowdown as well as the $920 million convertible bond maturity Tesla paid on March 1st, Tesla’s balance sheet is in an increasingly perilous position. We believe the ongoing Department of Justice investigator into potential securities and wire fraud related to Model 3 production statements prior to the company’s 2017 high yield offering as well as the SEC’s ongoing litigation with CEO Elon Musk over the “Funding Secured” debacle have likely blocked the company’s ability to do a registered equity offering. The MXWL merger proxy is taking a surprisingly long time to be declared effective. It’s almost as if the SEC is refusing to approve any registration statements for the company so long as Musk remains CEO. The poor performance of Tesla’s high yield bonds has likely limited the company’s potential access to that market. In theory, Tesla could do some sort of private placement in its equity, but we believe Musk has been unwilling to pursue this path since the likely pricing of such an offering would trigger his margin call and wipe him out personally. Assuming the company sells ~17k Model SIX, 42k Model 3s, is able to extend payables to 105 days from 87 days in Q-4, raises $50 million in Model Y/Semi/Roadster 2 deposits, spends $3 billion on capex over the course of 2019 ($500 million of which is funded by drawing on the China credit facility) we estimate Tesla will end Q-1 with consolidated cash on its balance sheet of a little over $1.6 billion. When you adjust this cash balance for the ~$600 million likely trapped in China (according to the 10-K Tesla had $749 million in cash outside the U.S.), we estimate Tesla ends Of with only roughly $1 billion in on balance sheet cash accessible in the US compared to over $800 million in consumer deposits. HeffX-LTN’s overall technical outlook for TSLA is Bearish in here.